The current emblem o Fraunce haes been a seembol o Fraunce syne 1953, awtho it daes no hae ony legal status as an offeecial coat o airms. It appears on the cover o French passports an wis oreeginally adoptit bi the French Foreign Ministry as a seembol for uise bi diplomatic an consular missions in 1912 uisin a design drawn up bi the sculptor Jules-Clément Chaplain. In 1953, Fraunce received a request frae the Unitit Naitions for a copy o the naitional coat o airms tae be displayed alangside the coats o airms o ither member states in its assembly chamber. An interministerial commission requested Robert Louis (1902–1965), heraldic airtist, tae produce a version o the Chaplain design. This did no, housomeivver, constitute an adoption o an offeecial coat o airms bi the Republic. A wide shield wi, on the ane end a lion-heid an on the ither an eagle-heid, bearin a monogram "RF" staundin for République Française (French Republic). A laurel brainch seembolises victory o the Republic. An aik brainch seembolises perennity or wisdom. The fasces, a seembol associatit wi juistice (the bundle o rods an an axe, carried bi Roman lictors). 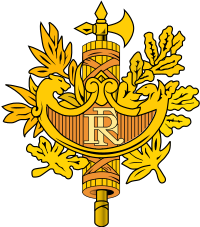 In September 1999, the French govrenment adoptit a unique offeecial identifier for its communication, incorporatin the Republic's motto, the colours o the banner, an Marianne, the Republic's personification. ↑ Service d'Information du Gouvernement (24 September 1999). "Charte Graphique de la Communication Gouvernementale" (PDF). Wikimedia Commons haes media relatit tae Coats of arms of France. This page wis last eeditit on 13 Juin 2017, at 22:22.